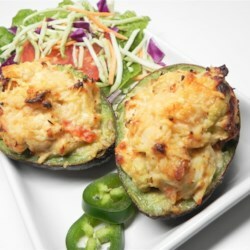 I had eaten baked avocados at a local Mexican restaurant and fell in love with them. I came across this recipe and hoped it would compare. RICH, CREAMY, SATISFYING dish. I did bake them in the avocado shell with the shells nestled in muffin tray. The next day I had some left over and they looked a little dry so I spread a dollop of french onion dip. Oh my, this really kicked it up a notch! I think next time I make these I will add some of the french onion dip and cilantro as well. Finally, this fits into a low carb/keto diet with fat 25.2, protein 20.1, and carbs at 9.4. Great recipe!